Regeneration, resolution and The Time of the Doctor (2013) | Randomwhoness: a Doctor Who blog by Johnny Spandrell. Sampling stories in random order. It starts with a mysterious signal emanating from an insignificant planet. The signal attracts an armada of alien spaceships piloted by a Who‘s what of monsters. But this isn’t The Pandorica Opens. It’s the 2013 Christmas special (my random Who generator loves these; its chosen 3 out of 9 of the buggers) and Matt Smith’s farewell story. In the DWM preview for this story, showrunner Steven Moffat said of it: “It’s the greatest single performance ever given by anyone who has ever played the Doctor”. And as it happens, I spent my last post ruminating on when each Doctor gave their best performance. So was Moffat spouting promotional puffery or was he on the money? Crafting a performance takes time. And that’s the one luxury Doctor Who has never afforded its actors. As many of the show’s actors have relayed in interviews, on old Who the low budget meant time was precious. So although there were days allocated for rehearsal, once on location it was get the scenes in the can and move on. Studio recording was even more brutal; get it done, effects and all by 10pm or the lights go out. And on new Who, although there’s a bigger budget, the sheer amount of material to shoot means time is still of the essence. Both Smith and David Tennant have spoken about the daunting workload on the show; how during production it’s basically shoot all day, go home to learn lines and repeat for nine months of the year. It’s a crushing schedule; on The Name of the Doctor there were 15 days between the first draft script and the start of the shoot. What I’m saying is, be it old Who or new, it’s amazing we got/get anything half watchable, let alone the many fine performances it does offer. With that in mind, let’s look at the acting challenges facing Smith in his final episode. He’s in nearly every scene. He’s being the Doctor at three different ages, under two heavy make ups (but this isn’t The Sound of Drums/Last of the Time Lords). He has to create a relationship with an inanimate cyberhead (hmm, should it have been K9’s head?). He has to be seductive with Tasha Lem, fatherly with Barnable and man up with the monsters. And with Clara he’s performing in a screwball comedy duo, making us care about their relationship enough that it breaks our heart to see them parted at story’s end. And much of the scenery’s not actually there, because nearly everything’s on green screen. And on top of it all, this job which has consumed his life for the last four years is coming to an end, so emotions are high. Smith does a terrific job at all this and more. But somehow this story doesn’t quite feel like the tour de force that Tennant had in Human Nature. Last entry, I talked about how a good story that pushes the Doctor in new directions helps makes a standout performance. And The Time of the Doctor is that, but it’s also the culmination of 4 years of hint dropping and mystery making by Moffat. So often the story seems to stop to pick up some loose end or other, be it ‘who blew up the TARDIS’ or ‘what was behind that door in The God Complex‘ or ‘has the Doctor run out of regenerations’? (Personally I’m still waiting to find out why the duck pond in The Eleventh Hour had no ducks. We need to know.) Smith doesn’t get as clear a run at it as Tennant did with the uncluttered Human Nature. For me, Smith’s best performance is to be found elsewhere. And I haven’t quite decided where it is. But I think it’s somewhere around the beginning of his second season. It’s here where there seems to be a definitive confidence in his characterization; an solidifying of that peculiar mix of gentle otherworldliness and childlike delight. Perhaps it’s when he’s playing at Christmas gift bringer in A Christmas Carol. Or perhaps its when he’s trying to piece together what’s happening to his life and his friends inThe Impossible Astronaut. Or perhaps – and this is where I’m leaning at the moment – it’s to be found in the highs and lows of meeting his own TARDIS in The Doctor’s Wife. Still, there’s much of interest going on in The Time of the Doctor. Clara gets tricked into returning to Earth as a way of ensuring her safety (but this isn’t The Parting of the Ways). Then she piggy backs on the outer hull of the TARDIS through the vortex to rejoin the story (but this isn’t Utopia). The stop/start nature of her story might seem a little offputting, but it’s an elegant device for showing the passage of long periods of time. In a way, it’s a pity we (the audience) don’t stick with her throughout, distancing us from the Doctor’s story and making his increasing age and infirmity a more immediate shock. But we need to see what’s happening on Trenzalore in the gaps, because the Doctor’s defence of the town of Christmas is the heart of the story; to prevent another Time War the restless wanderer will settle down and commit to a cause. And because this takes hundreds of years (in which time the town barely changes, but shush now), we see the youngest ever Doctor become the oldest. Surely this is Moffat both playing to Smith’s strengths (he has often claimed that Smith is best at portraying the Doctor’s great age) but also indulging in some delicious irony; how else should the youngest Doctor die but through old age? This leads to the episode’s neatest trick – the regeneration. It’s not so much that it delivers the Doctor a new lifecycle, though that does feel like a cumbersome burden gratefully abandoned. It’s that the regeneration is the resolution of the story, the first time that’s happened. It’s the way of solving the problem. As it carves through those Dalek ships, it brings the siege of Trenzalore to an end. Every other time the Doctor’s regenerated, that’s been the consequence of the Doctor’s role in the story – the price he’s paid for winning through. Here regeneration is the sweet dessert at the end of the meal, not the unwanted bill. 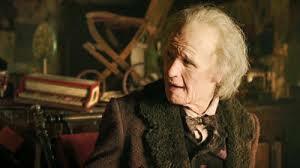 It ends with the young, handsome and funny Doctor restored pre-change, but this isn’t The End of Time. There’s no drawn out valedictory tour of past companions, just a short scene where the differences between Doctor and actor become hard to discern. “I will not forget one line of this”, says the Doctor, but that word ‘line’ seems to deliberately reference the lines which Matt Smith has spoken in the role. “I will always remember when the Doctor was me”; again it could be Matt speaking, not the Doctor. And thinking back, whether he was being mobbed by adoring children, or walking past walls plastered with fan’s artwork or even revealing his newly shaven head, this story has deliberately blurred the lines between actor and Doctor. And thus it acknowledges fictionally what the viewers already know in fact; it’s goodbye to both. But then a whiplash crick of the neck, and the new man arrives. After an hour rich in sentiment, the show rolls on, with its trademark lack of sentimentality. NEXT TIME: Point the dog against the rock! We get big, green and rude with The Creature from the Pit.